I am so excited about this place. Welcome to Tasting Counter, Boston’s first tasting menu “ticketed” restaurant from Chef Peter Ungár (Aujourd’hui, Michelin-starred Le Grand Véfour and Le Céladon in France). It’s been two long years. I first met Chef Peter Ungár in 2013 when I experienced an incredible tasting menu right inside his home. It reminded me of those underground, “closed-door” restaurants that are so popular in New York (and Argentina, interestingly enough) right now. At the time, Chef Ungár was just starting to plan and test potential dishes and menus for his future restaurant. Even then, I was amazed at the level of food he could produce right out of his own kitchen. It was seriously quite impressive. Since then, Chef Ungár has been searching for just the right space. That space finally turned out to be a unique spot inside Aeronaut Brewing Company’s building (a cool space also leased out to other small local businesses). Once Chef Ungár secured the spot, he began constructing the restaurant to look just like what he had envisioned – a place where all diners would sit at counter seats, watching the chefs cook right in front of their eyes. There are obvious benefits to counter seating. Diners get to watch chefs prepare dishes right before their eyes. Chefs are able to serve food the moment the dish is done. Diners taste the food at its freshest, its best. We finally visited Tasting Counter for Bryan’s birthday in October. Tasting Counter does a ticketing system where you purchase “tickets” to a dinner. You pay one up-front fee which includes the multi-course meal, drinks (sake or wine pairing), taxes, and gratuities. Tickets cost $165 on Tuesdays, Wednesdays, and Thursdays, and $180 on Fridays and Saturdays. The day we went (a Saturday evening), every single seat was filled. The “show” was sold out. We started with a series of amuse bouches. First (on the left), we tried a super thin rice crisp topped with scallop mousse, lemon zest, and dried scallop roe powder. The lemon flavor was quite pronounced and the overall bite was pleasantly savory. Next (in the middle), we sampled a crispy gougere with smoked paprika and thyme. Finally at the right was my favorite, a foie gras sesame “sandwich” made with a crunchy, sweet sesame tuile with a creamy foie gras center. It was a lovely combination and a great pairing of flavors. Our first course, Grapefruit Three Ways, incorporated grapefruit elements in three different ways. Off to the side, a grapefruit marmalade was covered with a grapefruit flavored gel. In the middle sat a local hake that had been cured for thirty-six hours with a mixture of parsley, basil, cilantro, and grapefruit juice. After drying for twenty-four hours, the hake was sliced and topped with smoked sea salt, fresh grapefruit, and flowers from garden. A creamy avocado mousse tied the rest of the dish together. And then Chef Ungár brought out a tray with the most gorgeous black truffle. He used it in the next dish, a European Sea Bream served with artichoke chips, a black truffle artichoke sauce, and a black truffle sauce. This dish was incredible. The truffle flavor was intoxicating, and came together so nicely with the strong artichoke parts of the dish. 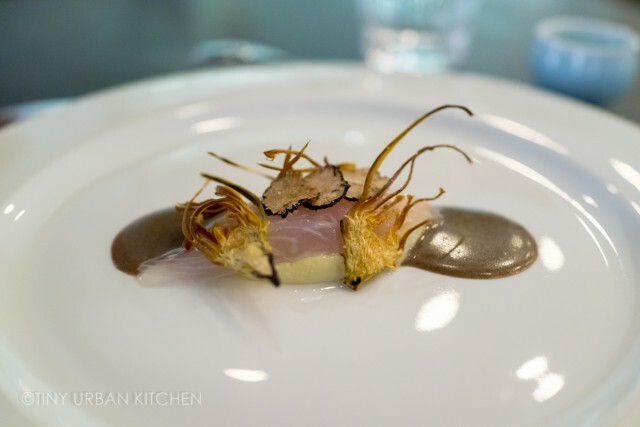 The raw hake was super tender and mild, allowing the truffle and artichoke flavors to truly shine. It was fun sitting at the counter, where we could watch the upcoming dishes being prepared. Next was a hand rolled Seaweed (nori) pasta tossed with maitake (hen of the woods) mushrooms, topped with deep fried tiny anchovies and served in a bonito broth. The tiny anchovies, which were pan-fried in oil, soy sauce, and sugar, is a delicacy in Korea (“like caviar”, they explained). The dish was fantastic. The hand-rolled pasta had a great, al dente texture. The broth was beautifully complex, made with shallots, bonito flakes, and kelp. The dish was refined, delicate, yet extremely complex in flavor. Next came a gorgeous piece of barely cooked Ocean Trout topped with sea salt from Martha’s Vineyard. This was served over a shallot sauce together with fermented black soybean sauce and orange blossom gel. I loved the barely cooked ocean trout, which was super fresh and incredibly tender (like sashimi except that it was a tad softer). The gel was quite sweet, though the sea salt helped balance it out. Next came Monkfish, often referred to as the poor man’s lobster because of its similar flavor and texture to lobster. The monkfish was served on top of grilled fennel and served with salmon roe marinated in saffron butter, a tomato sauce, a garlic sauce, and a flavorful fennel broth. The dish had all the flavors of a bouillabaisse (traditional French fish stew), but deconstructed. We then took a short interlude to enjoy a palate cleanser: Schisandra Berry + a warm fresh pine nut cookie. This drink was inspired by a Korean drink called omija cha, so called because this tea is supposed to embody all five flavors in one drink: sweet, sour, salty, bitter, and umami. We could taste sweet and sour most prominently, a bit of salty and umami, and the least of all, bitter. And then it was time for the last few courses. We started with a perfect cooked Miso Cured Duck, which came with a slice of celery, apple, and daikon gel, celery foam, and a soy and fish sauce aioli. The Dry Aged Rib Eye & Cap of Beef cames with a red curry foam and dots of an intense cilantro sauce. There was also a burdock root puree as well a crispy ginger salad. And then it was time for dessert! We watched the chefs whip out a blow torch to brown the meringue on the dessert. It smelled like toasted marshmallows, which was heavenly. Pictured on the left is a Lime Curd Cake served with a passion fruit sauce which was surprisingly tart, ginger ice cream, the brulee ginger meringue, and a candied orange peel. I really liked this dessert! I loved the slight crunch from brittle and the overall tart flavors of the dish. Our next dessert was a collaboration between Tasting Counter and Somerville Chocolate, a small local company that were also located in the same building. This Chocolate Bar, which was made with 50% Hawaiian chocolate, and 50% Nicaragua, Dominican, and Jamaican chocolate, came with dips of guava sauce and macadamia brittle. Chef Ungár really tried to source the entire bar from the U.S. (using 100% Hawaiian chocolate), but decided that the bar tasted much better when he mixed in the chocolates from other regions. We finally ended with a couple mignardises: a yuzu chocolate truffle, almond strawberry almond cake, and a plum vanilla pate fruit (fruit chew). It was a wonderful dinner and a great way to celebrate Bryan’s birthday. We really enjoyed sitting at the counter and just watching the chefs as they prepared each upcoming dish. Chef Peter Ungár is extremely talented and has created a really fun and interesting tasting menu using top notch ingredients. $165/$180 is a also a pretty good “value” considering it includes a ~10 course tasting (which can easily cost $100 alone at other similar-type restaurants), generous wine/sake pairing (typically another $50-$100), plus tax and gratuity. I think he’s able to keep the prices more reasonable partly because of the location, which is a little off the beaten path. They also do a fun late night menu (10:30pm – 12:30am on Thursday, Fridays, and Saturdays) that consists of $5 bites and various beverage options, including natural wine, local cider, and craft cocktails (all $8 each). You can also order snacks to bring back to Aeronaut Brewing Taproom, which is right down the hall. Whether you come for the tasting menu or the late night, definitely come check out some of the creative dishes that Chef Ungár is creating. You won’t be disappointed. « Staying Healthy Amidst a Crazy Year of Travel + $100 Giveaway!